If you would like to chat about fundraising coaching, nonprofit leadership, or fundraising careers, just email below. BUT we prefer phonecalls. For fundraising consulting, board retreats, strategy sessions Please see what we offer here. For speaking, webinars or workshops View a list of potential speaking topics here. I get such joy out of helping many different kinds of causes succeed. This is truly my calling, and I cannot wait to connect with you. I’m passionate about teaching people how to change the world. Mazarine Treyz is the author of The Wild Woman’s Guide to Fundraising, and founder of WildWomanFundraising.com, a popular fundraising resource with 50,000 monthly readers. Her second book is The Wild Woman’s Guide to Social Media, published 2012, given a 5 star rating by Nonprofit.About.com. Her latest book, Get the Job! 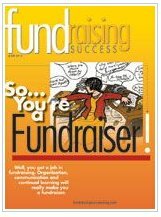 Your Fundraising Career Empowerment Guide, was given a 5 star review by Nonprofit.About.com. Ms. Treyz has co-founded a nonprofit and worked in fundraising roles for 10 years. She’s raised millions for small, national and international charities via grants, events, sponsorships, crowdfunding, appeals and more. Fundraising background: In 2000 Mazarine was an intern for Planned Parenthood Federation of America. In 2003 Mazarine wrote her first grants for Indonesian nonprofit Yayasan Emmanuel. In 2005 she co-founded a nonprofit called “The Moon Balloon Project” on the south shore of Boston, MA. Since that time she has raised over $1M for various local, national, and international nonprofits with appeals, emails, grants, sponsorships, and more. She knows the pains of working in a one-person and small development shop and loves to help people trying to do it all. Ms. Treyz has taught over 15,000 national and international nonprofits how to fundraise since 2009. Have people gotten results from her trainings and workshops? YES! Here are some results. Mazarine Treyz loves to read, draw, make encaustic art, write, and encourage others in their dreams. 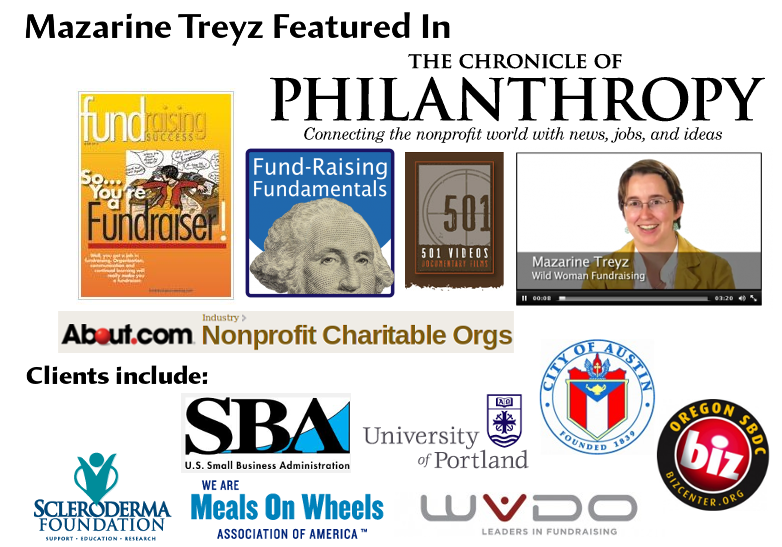 Mazarine Treyz has been featured on national syndicated media, including The Chronicle of Philanthropy, Philanthropy.com’s Fundraising Fundamentals podcast, Fundraising Success Magazine (now NonprofitPro), Tony Martignetti’s Nonprofit Radio show, and the Career Clinic with Maureen Anderson. For media before 2012, please see our media page. Since I first stumbled across your “Wild Woman Fundraising,” I have wanted to be in touch with you. Like so many of my colleagues–I think especially my women colleagues–in fundraising, we’re running at a thousand miles and hour and want someone to come alongside us to tell us we aren’t crazy, we’re making progress on doing the right things, we are making a difference. Thank you for playing that role for me. I have 33 years of non-profit fundraising experience. I earned my Certified Fund Raising Executive designation in 1991. Thanks for bringing what you do to the rest of us. Your resources, your presence, your personal stories, the successes and opportunities you share are very meaningful to me. Please keep doing what you are doing! “When I stumbled upon Mazarine’s blog at midnight, I was in search of answers; answers that would take my nonprofit to the next level. Being a new executive manager in a new career field, I often wondered if my current approach was the best approach or even an effective approach. I found the Wildwoman Fundraising blog and immediately signed up for the newsletter. I have been a huge supporter ever since. Mazarine confirmed my initial efforts and instincts, and she was a great encouragement to my capabilities. Through her webinars, very informative blog post, and newsletters, my e-mail marketing open rates have increased to 17% from 9%, my fundraising revenue has increased 50% in 7 months, and we have implemented key development plans that would have never been executed had it not been for her consulting. I have purchased both the Wildwoman’s Guide to Fundraising and the Wildwoman’s Guide to Social Media and both books are absolutely wonderful resources for any nonprofit management and development staff. I would certainly recommend Mazarine for any of your nonprofit/fundraising needs!” -Kenita Pierce-Lewis, Founder, H.O.P.E. Inc, Georgia. WildWomanFundraising.com launched in December 2009. This blog has 50,000+ monthly readers, over 270K incoming links, and is consistently rated one of the top fundraising blogs by industry experts, including About.com Money, NonprofitPRO Magazine, and people on Twitter too!